The Paul Erdős Challenge was launched successfully in India in 2015. In its inaugural year, the program was lucky to have on board as graders Shri Reebhu Bhattacharya, undergraduate in Engineering Physics at IIT Mumbai, and Shri Anirban Kundu, Ph. D. candidate in Mathematics at IISc. Their dedication in responding to and guiding students was critical to launching the program successfully. In addition, Shri Madhu Belur, Professor of Electrical Engineering at IIT Mumbai, helped coordinate. The program also benefited from the generous help from Prof. Shiva Shankar, CMI, Dr. Shailesh Shirali, editor of At Right Angles, and Prof. Chandrashekhar Khare, TIFR. The trust thanks all of them for making the launch a great success! Shri Anirban Kundu was presented with a copy of Proofs From The Book, for his exemplary work as a grader during the 2015-2016 season. The book is inspired by the frequent reference by Paul Erdős to a book of perfect proofs! 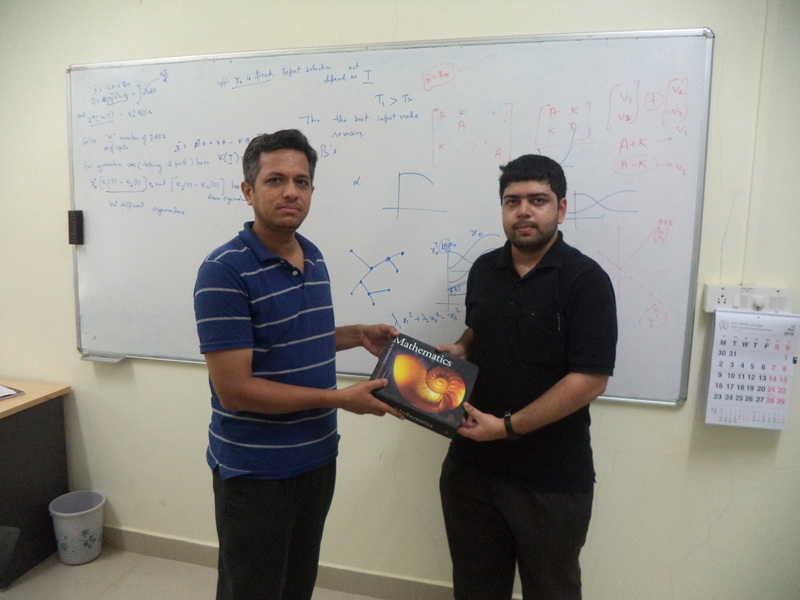 On behalf of the trust, Prof. Madhu Belur presented Shri Reebhu Bhattacharya with a copy of The Princeton Companion to Mathematics in appreciation of his stellar work as a grader during the 2015-2016 season.